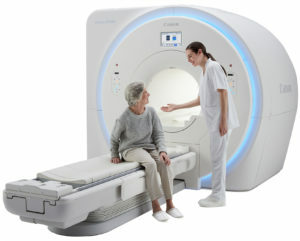 The newly introduced Vantage Orian 1.5T MRI system from Canon represents a new standard in the premium wide-bore 1.5T market with new technology designed to boost productivity, enhance patient comfort and deliver diagnostic clinical confidence. • All-new detachable, dockable table option enabling preparation outside the scan room, enhancing workflow and allowing medical staff to respond to patient requirements quickly and easily. • Saturn Technology for high performance imaging capability, including a new slim gradient that delivers a gradient performance with a maximum amplitude of 45 mT/m, combined with a slew rate of 200 T/m/s that enhances high resolution and diffusion imaging for improved image quality. • Adaptive noise cancellation PURERF Rx technology that reduces noise at the source, resulting in an increase in SNR by up to 38 percent and enhanced image quality. • A re-designed digital gantry interface which displays important patient-related and coil information, allowing clinicians to ensure a proper and complete setup without leaving the patient’s side. The Vantage Orian also offers a suite of software enhancements to help reduce scan time and increase productivity. New features include the Multiband SPEEDER, which enables clinicians to reduce DWI acquisition times, and the k-t SPEEDER (up to x8 accelerated), which allows high frame rate cardiac cine and perfusion imaging with free breathing – enabling clinicians to image a wide range of cardiac patients while reducing stress to the patient. The system also features EasyTech technology which enables clinicians to improve workflow with automatic slice alignment for neuro, spine and cardiac exams, and FSE Dixon, which allows clinicians to take four contrasts in just one scan to show uniform fat-suppression in difficult-to-shim areas. The all-new system enhancements come in addition to the existing patient-friendly MRI features that Canon Medical offers, including the 71cm wide bore patient aperture and in-bore immersive virtual experience which encourages patients to relax and stay still, enabling clinicians to produce stable, high-quality imaging, as well as Pianissimo technology which significantly reduces the noise in and around the MRI environment and Pianissimo Zen quiet sequences which further reduce noise to just above ambient noise level, making exams even more comfortable and easier to complete.